The fruit of the breadnut tree (Artocarpus Camansi) is used extensively in Trinidad and Tobago. The young green fruit contains several nuts inside. The seed is dark-brown with an inner fragile paper-like membrane which surrounds the edible portion of the seed. 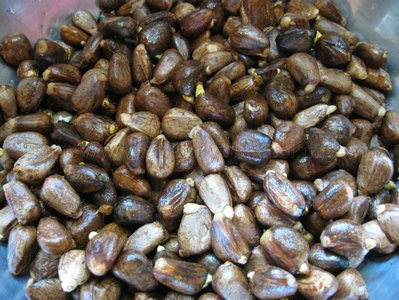 This sweet nut is curried and eaten with buss up shut, dhal puri, sada roti, bake or even with rice and some type of salted meat like pig tail, pig snout or salt beef. Yum! 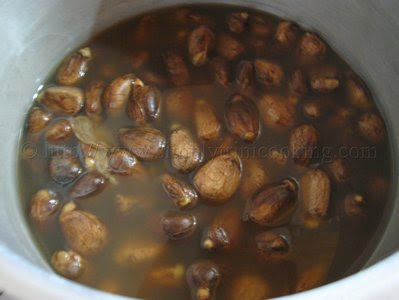 However, when ripe it’s a different story: the full seeds boiled in salted water are a delicacy with a slight twist. Yes! A slight twist. You see the seeds cause flatulence when eaten and some people being mindful of this try to avoid chataigne. But, If you can get over that, it is enjoyable. It seems that some people know how to boil chataigne without causing flatulence to occur. I once had chataigne and it did not “affect me”. So what’s the secret? Nothing to it really, the seeds must be fresh and not black. So now you know: just get the freshest seeds to boil. Or, if you are not sure of the freshness just enjoy your chataigne and stay home…….by yourself lol!!! Enjoy chataigne, an all natural trini snack. Wash after cleaning the seeds from the pulp. Put the chataigne in the pressure cooker and add enough water to cover it. Add salt to taste and pressure cook for ten minutes. 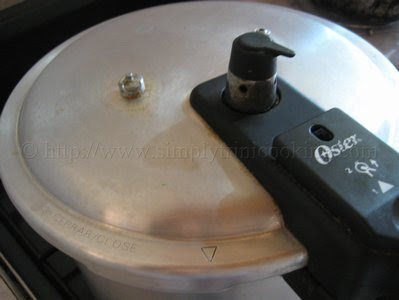 Note: If you don’t have a pressure cooker just boil for about 30 minutes. That’s all there is to a wonderful nutritious snack like chataigne, which is a good source for protein, but low in fat. More recipes to come. Don’t forget to leave your comment on boil chataigne in the comment box below. Oh! I think I saw this tree here! this is the only part of chataigne I like. some years ago i heard that if u don’t eat the little knobby part to the top, then the flatulence doesn’t happen. though that part is probly the tastier part, i stopped eating it and it has worked for me ever since. my mother is queen of chataigne when its in season, and so i have eaten quite a bit of it. just dont eat the part at the top and you’re good to go! Shorty that’s the first time I have heard of this Next time I will have to try that. Does anyone know where you can buy breadnut in the U.S. My wife can curry Chataigne but it is hard to find in the state. Most people think it is breadfruit which drives us crazy. I am sorry, I am not familiar with that plant, the Moussara tree. However, I am doing some research on it, if I get any information I will pass it on. Thanks for asking. I am now seeing this e-mail. Most of the Moussara trees have been felled due to disease or old age. However I have a large tree in deep south My problem is how to collect the fruits. When I was growing up in Barrackpore, my family collected the ripe fruits – green skin and brown fruit with some nectar around the nut. We boiled and fried the soaked nuts and prepared something similar to channa. The taste was different and the salted and peppered nut was a delicacy. I think it is called Teepee Tambo. Saw it on the curry chataigne post so I will reply there. I haven’t had this since I was about 9 years old. My aunt used to make it for me all the time but she moved away. Saw some on Charlotte street yesterday and I bought it but when I got home I realized I had no idea what to do with it. Thanks for the instructions.